We've all heard this old proverb which may have been paraphrased from something Plato said long ago. It's self-explanatory, succinctly describing the subjectivity of beauty. Whether you're talking about a beautiful person, scene, object, or concept, what one person considers "beautiful" can vastly differ from what another person considers "beautiful." The same goes for "pretty." I used to use the words synonymously but after a comment Jim made recently, and looking at the definitions in my American Heritage Dictionary, there are some subtle differences: "Beautiful," the most comprehensive, applies to what stirs a heightened response of the senses and of the mind on its highest level. "Pretty" suggests only sensory appeal of a limited and superficial nature. The dictionary also gives subtle nuances of other synonyms like lovely, handsome, comely, and fair. Some appeal more to emotional responses we have, some to more intellectual ones. So what brought up the semantics? Considering all the somewhat negative things I had to say recently about Arizona in general and the Phoenix area in particular (mostly economic problems and high costs), I had a surprisingly defensive reaction to that statement! 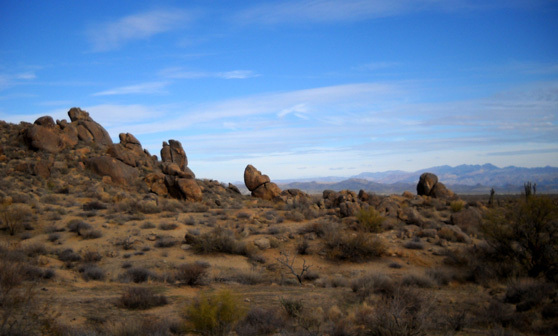 I really like to visit McDowell Mountain Park. 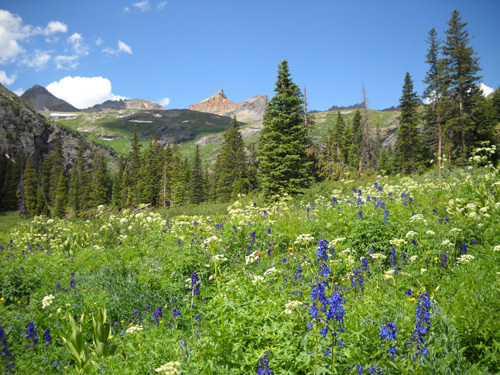 the Beartooth Mountains in Montana, the Appalachian Mountains and foothills in the East, the rainforests of the Northwest -- the types of places Jim considers "pretty" and more desirable to visit/live. OK, I prefer those places, too. 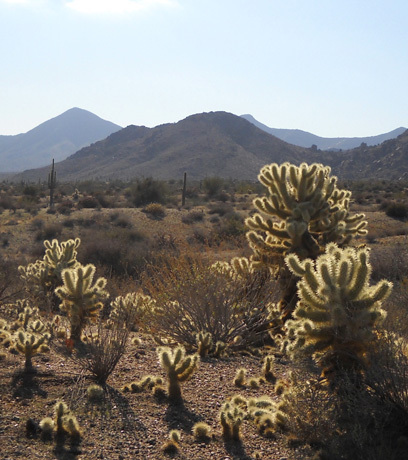 I'll concede that desert terrain usually isn't pretty, unless you're talking about White Sands National Monument in New Mexico or a desert in springtime, when the cacti are in raucous bloom. 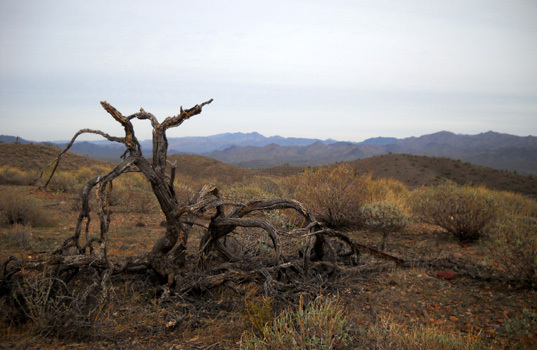 But for the sake of variety, I still like to visit desert areas in the winter. I think deserts fall under the dictionary definition of "beauty:" 1. a pleasing quality associated with harmony of form or color . . . or other, often unspecifiable property; 2. appearance . . . that arouses a strong, contemplative delight. 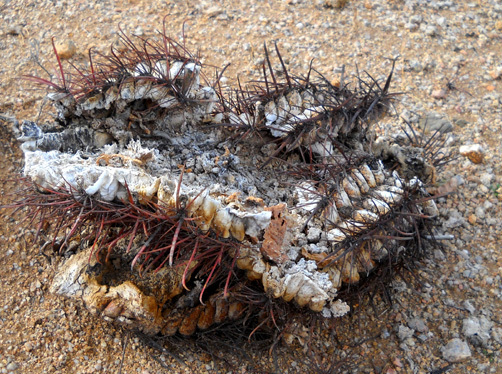 There are definitely things I see in the winter desert that bring me delight. 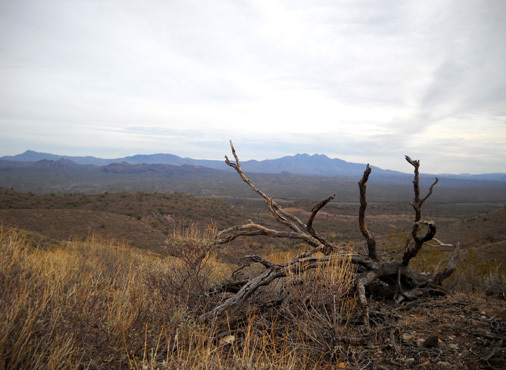 The beauty of the Sonoran Desert is definitely stark, but I see lots of beauty here. I think I can see that more than Jim because almost everything I view is with a photographer's eye. 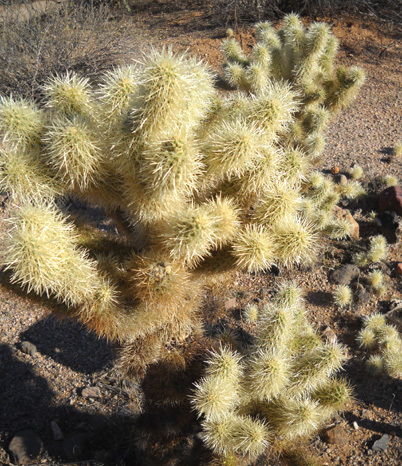 It took his comment about the desert not being "pretty" for me to really think about how I view the world. When I go for a walk, run, or ride (even in a motorized vehicle), I usually see things through a figurative, and sometimes literal, camera lens. I'm pretty sure my perspective is different than most other people's perspective! I've always been like that, composing photographs in my mind as I observe everything from sweeping landscapes to minute details. There is always the thought of how to best photograph a particular image with pleasing composition in mind -- even when I don't have my camera with me! I've never discussed this with other amateur or professional landscape photographers, but I bet they often do the same thing. It's just something my brain automatically does when I'm outdoors. It's second nature. I've always been more interested in photographing scenery and things than people. I'm not anti-social; I like people, but photographing them is more complex in so many ways. I don't care for indoor photography, either. I seldom see something indoors and think about how I'd want to photograph it. It's an outdoors thing with me. Now that I'm doing a lot more walking than running it's even easier to see these compositions as I'm moving through the landscape. But even when I've been running the past thirty years I've often stopped dead in my tracks if something interesting or "beautiful" catches my attention. 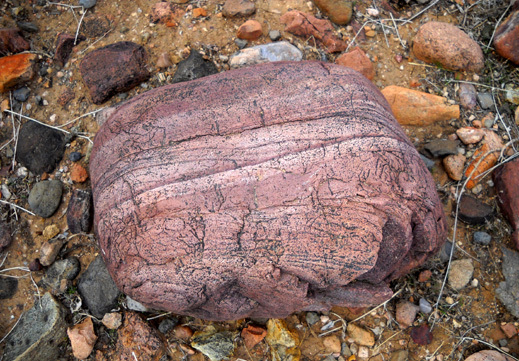 McDowell Mountain Park is full of colorful rocks. This one is on the Scenic Trail. and blow around in the wind. 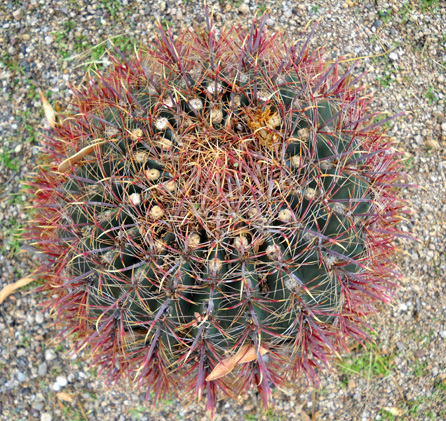 You do NOT want to come into contact with one of these spiny balls! 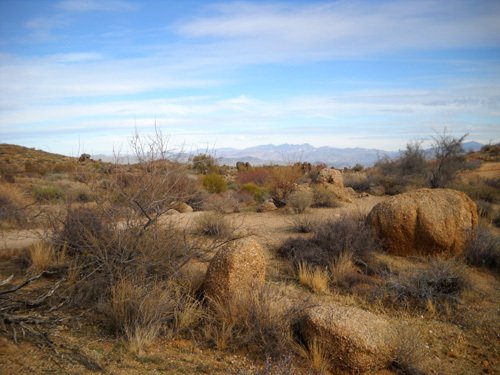 I've stopped abruptly to take pictures at McDowell Mountain Park many times, especially since Jim and I had this discussion. Now Jim and I both have a literal new perspective from our campsite in McDowell Mountain Park. We discovered a new wrinkle in the park's procedures since our visit earlier in the year: campers can still extend their 14-day "maximum" stay if there are campsites available, but they must move to the other loop. They can't remain in the same site, like we've done previously. 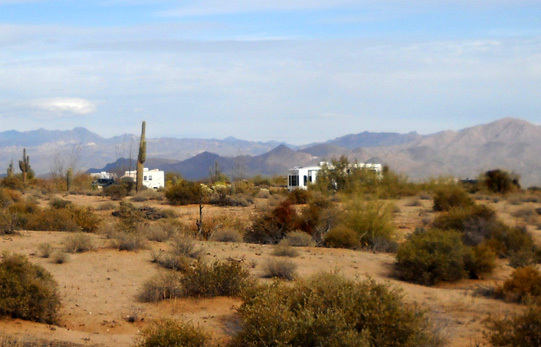 There are no undesirable campsites at McDowell Mtn. Park. So after we'd been in the north loop for 14 days, we had to move to the nearby south loop Sunday morning. I had some concerns about that because the south loop was usually about three-fourths full while "our" loop was only one-fourth to one-half full. Would we be able to find a suitable spot? The good news is that we did find a nice site in the other loop. It took about two hours for us to batten down the hatches, use the dump station, and get set up again in our new location, another periphery site. 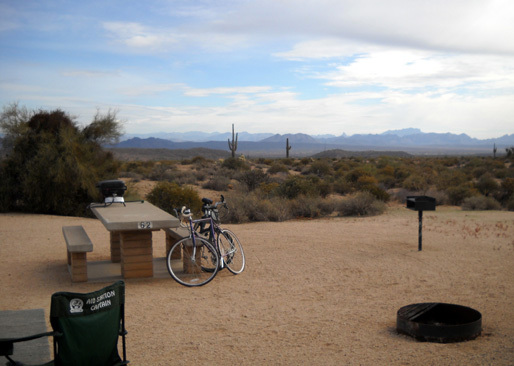 Although we're sitting closer to the road in our current roadside (not back-in) site, there are some advantages: a great view of the fountain in Fountain Hills, a different range of mountains to look at, proximity to another part of the trail system, and more coyote activity. Forget what I said a few days ago about Cody's lack of interest in coyotes. Now that he's had some recent close encounters, he's alternatively very curious (let's play!) and very territorial (this is my turf!). Yeah, like it's his territory! Not. 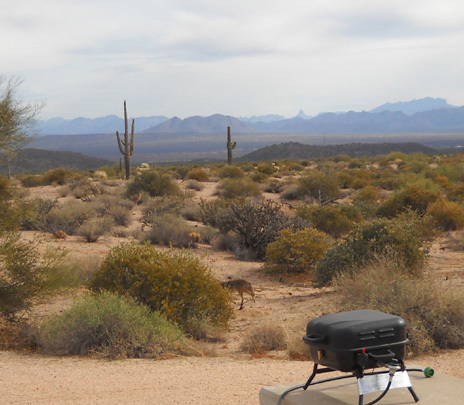 One day as Cody and I were returning to the camper about 200 feet cross-country from the Granite Trail we surprised a coyote that was near our picnic table. Cody saw it first and ran like a streak toward it. He didn't get far. I commanded him to "leave it" and he immediately came back to me (good boy!). The coyote scurried off but remained within sight out the window after we went inside. The coyotes are used to people in the campground and have probably gotten snacks from some of them. They are still wild and fearful, though. It's not like you can (or should) pet them. And I certainly don't want one of them biting Cody in self-defense if he got too close. 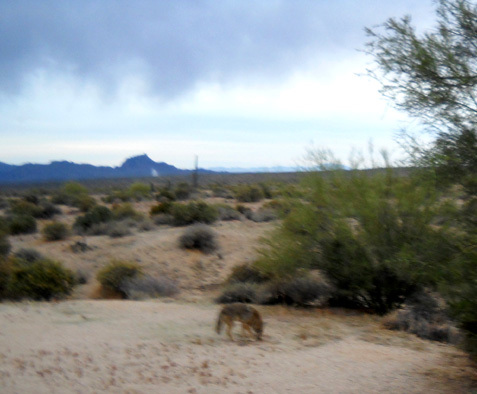 Photo of "our" coyote from inside the camper; he runs away when I try to photograph him outside. Another time a coyote walked to within about twenty feet of Cody while he was tied outside the camper. I was inside working on my computer. Jim was gone, running some errands. I heard Cody bark with some authority; the coyote responded with its distinctive bark/yelp, followed by a high-pitched howl. They went back and forth like this several times, each vocally defending his turf, until I opened the door to make Cody be quiet and the coyote ran off into the shrubs (next picture below). Wonder how long they would have kept that up if I hadn't interrupted them? Sometimes Cody will growl or bark when he's inside and hears/smells a coyote (or another dog) near the camper. In full defense mode, the fur on his shoulders stands on end and he tenses up, ready to protect us. Occasionally we elicit the same response out of him by excitedly saying, "Cody, there's a coyote!!" We really shouldn't tease him but his reaction is so comical that we just can't help acting like juvenile delinquents sometimes. We've seen only one coyote at a time; we don't know if it's the same one each time or more than one. 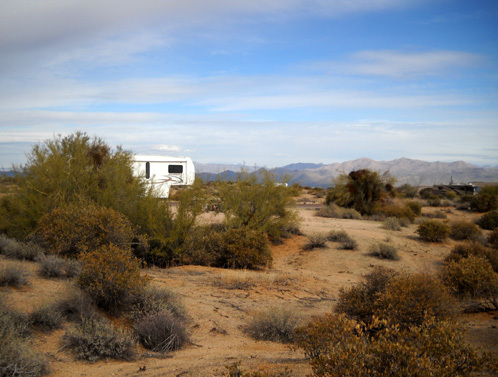 We hear more coyote choruses during both the day and night in this location than our other campsite. I don't know if it's the location or the near-full moon right now. Do coyotes really howl more when the moon is full? We still haven't had any close encounters this time with a javelina, doggone it. 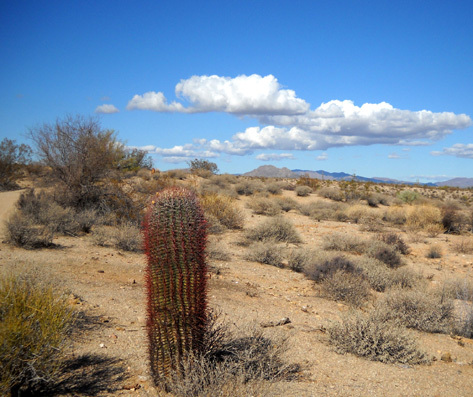 See why I like visiting the desert in the winter? There's the chance of seeing things like javelinas and cool cacti that we'll never see in a "prettier" place like the Tetons! After checking out a trail on foot today that's new to me (Rock Knob Trail, in the western part of the park), I finally took Jim's mountain bike for a spin -- the first time since my memorable crash on August 3. For various reasons I've been riding my road bike since the crash -- not because I'm afraid to get back on Jim's bike but because I just don't like it much and the gears don't all work properly. I really want my own new mountain bike that fits me as well as my Terry road bike; that isn't going to happen until sometime next year (I'm not talking about a $300 bike). After Jim assured me he'd thoroughly checked the gears and brakes, I rode his bike a couple miles around the campground roads to get a feel for it, then ventured out on nine miles of undulating, curvy, hilly, but fairly smooth trails (Wagner, Bluff, Granite). 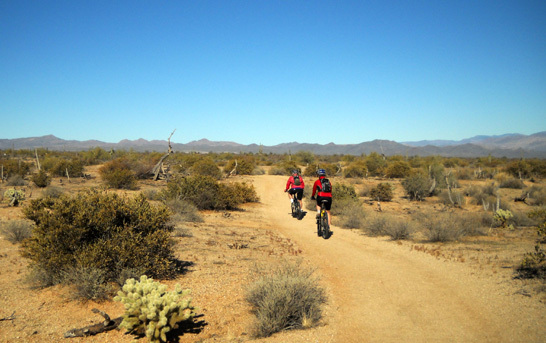 Two cyclists enjoy a smooth part of the Granite Trail. I think I had more fun doing that than anything else I've done so far on this trip!! It's definitely more fun than riding on pavement. I'm not very skilled at trail riding but each ride gives me a little more confidence to tackle a more difficult trail the next time. 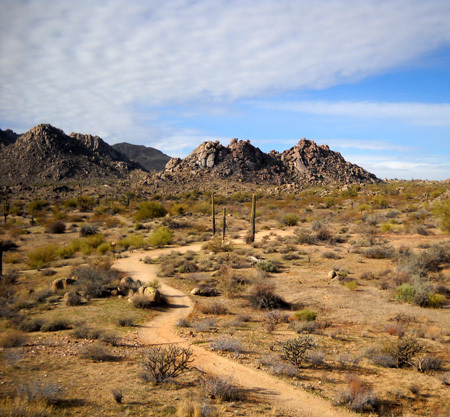 There are so many great trails to ride at McDowell Mountain Park that I just wish I'd gotten out there two weeks ago, and not on our next-to-last day here. 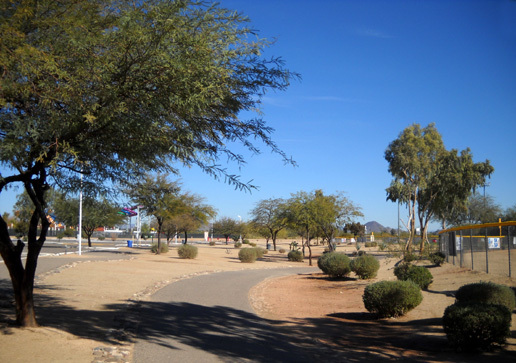 Tomorrow we're on the move again: across town to the Victory Lane sports complex in Glendale, a northern Phoenix 'burb. 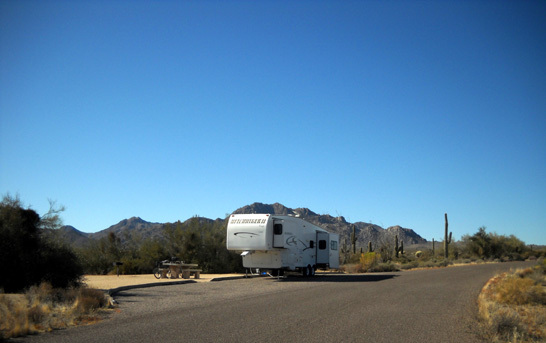 We're taking advantage of the invitation for runners to park their RVs in the large parking lot near the course for the Arizona Road Racers' "Run to the Future 24-Hour Race." Steve Finkelstein and the club are graciously providing runners with an alternate venue while Across the Years (ATY) is on hiatus. Jim's running as long as he can in the race, depending on whether/when his plantar faciitis flares up. I'm volunteering off and on in the aid station as needed, crewing for Jim, taking pictures, hanging out with friends like Anne Watts who aren't running this time, and trying not to whine about not being able to be out there, too. Actually, I'm a little surprised lately that I've pretty much come to accept this "no more ultra running" situation as I approach my 30th running anniversary on January 1. No more races (probably) takes a whole lot of pressure off of me! I wasn't expecting that. I'll write more about it in January.